E-mail written 1999 to Lew Griffin from Carolyn Dennis Culpepper (#36819), Deceased Oct 2010. Obituary of Carolyn Dennis Culpepper (#36819), published 1 Nov 2010. Death of Son 1878� Her son Roland Culpepper died in 1878 at Houston, Harris Co., Texas. Horace Culpepper, Son, M, Aug-1884, 16, S, TX VA TX, Clerk-Auditors Off. Horace Clark, Father, M, Jul-1819, 80, WD, MA NY NY, Minister. Ellen Reed, F, 34, Black, Servant, TX TX TX, Cook. Harris Co., TX: Roland H. Culpepper and Mamie K. Clark, 31 Oct 1878. 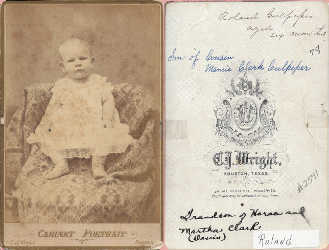 Mamie K. Culpeper; Widow [sic] of R. H. Culpepper, Resides at 317 Polk, Houston, 1890-1891; Working for Mamie K. Culpepper: Harriet Oliver, colored, Houston 1890-1891. Find A Grave Memorial# 40905045. Polk's City Directory, Houston, TX, 1917. Horace Clark, Bro, M, 58, S, TX US US, Music Teacher-Own Studio. Mary Katherine Culpeper, Harris Co., May 26 1921, 13981. E-mail written Nov 2005 to Warren Culpepper from Lorri Culpepper Towns, e-mail address. Leo Watley, Adopted son, M, Wh, 11, sng, MS/MS/MS. Marshall Culpepper, Son, M, Wh, 6, sng, MS/AL/MS. E-mail written Jun 2006 to Warren Culpepper from Nancy Karen Culpepper Harben (#53603), e-mail address. Cheryl Lynn Culpepper, Female, born __ 1948 in Harris Co., Texas, child of Harold Oree Culpepper and Frances Elizabeth Hewitt. Harold Culpepper, born 1919 in Mississippi. Resides in Harris Co., TX. Enlisted 3 Jun 1942 at Houston, TX as a Private. 4 Years of High School. Employed as a Motion Picture Cameraman. Married. 66" Tall, Weighs 141 lbs. Robert Harold Culpepper, Male, born __ 1954 in Harris Co., Texas, child of Harold Orre Culpepper and Frances Elizabeth Hewitt. Harold O Culpepper, Male, died 29 Dec 1981 in Dallas Co., TX. Donna Gayle Culpepper, Female, born __ 1952 in Harris Co., Texas, child of Harold Oree Culpepper and Frances Elizabeth Hewitt. Roy Lee Culpepper, Son, M, Wh, 2, sng, MS/MS/MS. Mose Stringer, Father-in-law, M, W, 73, wd, MS/GA/GA. Cloteal Culpepper, Daughter, F, Wh, 2, S, MS/MS/MS. N. A. Parnell, Boarder, M, Wh, 23, sng, MS/MS/MS. Samuel T Culpepper, born 1910 in MS, White, Married, Education: 2 yrs HS, Height/Wt: Unk; Resided in: Scott Co., MS; Enlisted 7 Mar 1944 at Camp Shelby, MS (Drafted). Ancestry.com. U.S., Department of Veterans Affairs BIRLS Death File, 1850-2010 [database on-line]. Provo, UT, USA: Ancestry.com Operations, Inc., 2011. Billy Wayne Culpepper, e-mail address. E-mail written 2004-2007 to Lew Griffin & Warren Culpepper from Shannon Leigh Smith Adcock (#50273), Haw River, NC, e-mail address. E-mail written 2002 to Lew Griffin from Elsie Jean Ward (Mrs. John Richard Mann).